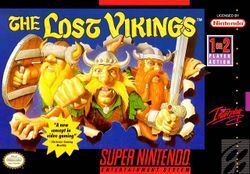 The Lost Vikings tells the story of three Vikings that have been abducted by space aliens. Each of the three Vikings has a unique ability that must be utilized to reach the exit in each level. The game is a puzzle-oriented platform game, with the Vikings running and jumping around in a side-scrolling alien spaceship, and the player determining how to use the Vikings' abilities to interact with the environment so that all Vikings can reach the exit. Game Boy Advance cover art. This page has been accessed 21,713 times.